Four years ago, the North Carolina Community Foundation began an ambitious plan to re-examine how we can best leverage the passion and talents of our statewide network of local affiliate foundation board members to ensure continued success. The Blueprint for Success was created from that process to provide a strategy that local affiliate boards can tailor to help strengthen their impact. The pivotal framework was born out of countless hours of work from the Affiliate Impact Committee made up of staff, and local and statewide board members. Advisory board members from affiliates across the state are actively carrying out this important cornerstone of the Blueprint, according to Migliore. She points to the Craven County Community Foundation (CCCF) as a recent example of how an affiliate board can enhance its impact by connecting local leadership around community needs. 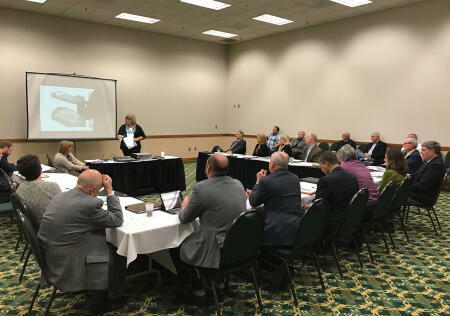 CCCF’s board of advisors formed an ad-hoc committee to strategically examine key local issues and community needs that present opportunities for their affiliate to lead. After several meetings, the committee identified homelessness as one of the area’s most pressing issues and pinpointed one local nonprofit organization that could help address the problem: Religious Community Services (RCS). RCS addresses Craven County’s essential needs by offering food, clothing and shelter to those who need it most. Tyler Harris, CCCF board president, was familiar with the work of RCS and knew it was amid a capital campaign to expand its facilities to better serve the community. Harris also saw a unique opportunity to convene community leadership representing local funders and government entities. Thanks to his efforts, the meeting attracted more than 40 leaders representing major funders and elected officials at both the county and city levels. The collaboration gave RCS the opportunity to raise significant awareness of its expansion campaign and has already directly resulted in pivotal grant funding with the door open for continued support. Craven County isn’t the only community drawing inspiration from the Blueprint to advance community leadership. On the other side of the state, the Catawba Valley Community Foundation (CVCF) board of advisors has been conducting a comprehensive needs evaluation using an economic lens. The board evaluated a wealth of data and research on local issues and needs, studying reports from workforce forecasts to health and human services data and educational gaps. From the evaluation, the board identified two critical areas of need: education and opioid addiction. Jamie Treadaway, CVCF board president, said the board brought research and information to a series of roundtable sessions designed to connect local leaders and nonprofit funders with direct-service providers. The meetings brought together leaders from the CVCF and the Unifour Foundation Endowment alongside local leadership and direct service providers for a powerful examination of community needs that presented important opportunities for growing the strategic impact of future community grantmaking. In the Rocky Mount region, the Futrell-Mauldin Community Foundation for Greater Rocky Mount and the Edgecombe Charitable Foundation have been directly involved with the annual Leading for Tomorrow Capacity Building Summit in partnership with the United Way of the Tar River Region. The Summit convenes the staff and board members from critical local nonprofit organizations and community funders for a day of comprehensive training, workshops and capacity building. In the same pursuit, the Beaufort-Hyde Community Foundation and the Wake County Community Foundation have both recently organized community nonprofit meetings focused on strategies to increase impact and build capacity across the nonprofit community. NCCF affiliates are connecting for community impact across the state through the Blueprint for Success in ways that will have a lasting local impact. For more on the Blueprint for Success and the Affiliate Impact Committee, visit this page.